Santa Mariña is located in a privileged enclave from where we can follow attractive routes through diffrent journeys. One of them goes through the village and fields that surround it, another leads to the rocky formations called caldeiras created by the the Castro River in its couse through the Couceiro parish. The short distance to the coast will make it easy to discover Cabo Touriñán, the most westerly point in Spain, from where various routes leave through its rugged landscape. Not far from this enclave awaits Fisterra, the point the romans baptised The End of the World. Os Muíños beach is only 4 km away from the house, and a short distance away from Lago and Nemiña beaches, the latter is well-known amongst surfing aficionados. Another place of interest is Ézaro, unique for the River Xallas waterfall, that can be enjoyed punctually during . Lovers of stone tombs have a great field of discovery in this area. The Route of the Dolmens takes us to the origins of Galician civilisation, 6000 years ago. The petroglyphs of Boallo, the dolmens of Berdoias, Pedra da Arca (Baiñas), Pedra Cuberta (Treos), Arca da Piosa (Serramo) y Dombate (Borneiro) are archaeological deposits that won't go unoticed by the learned in these subjects. Another ingredient of the Costa da Morte is its richness in cratfs. Vimianzo Castle, another residency of the Counts of Altamira, houses samples of live craftsmaship all year round where we can see the Bobbin Lace makers of Camariñas, Muxía and Vimianzo, the potters of Buño, linen work, clogs makers, and other traditional trades. Furthermore, if you visit on the 18th of July you will be able to enjoy the traditional outdoor Festival of Santa Mariña, a saint well-known for her virtue for curing animals. On this date the auction for ropes and pig trotters takes place, and the devout offer these to the virgin in gratitude for their granted favours. The pilgrims also take this opportunity to collect sacred earth that is supplied to their animals when they suffer from illness. 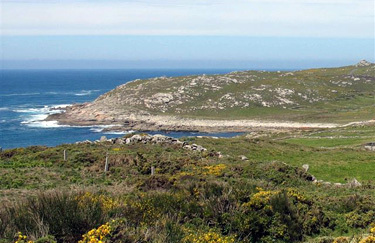 Less than 4 km away from Santa Mariña the two stretches of the Way of Saint James pass by, and from Fisterra and Dumbría lead to Muxía, the final point of this extension. 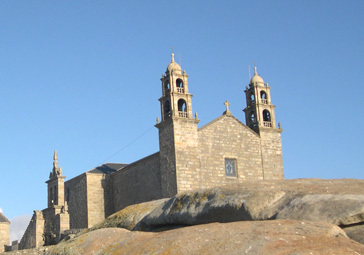 The Sanctuary of the Virgen de la Barca is 8 km away, famous for its legendary rocks and ntimately linked to apostolic tradition. Legend has it that Santiago Zebedeo found himself amongst the cliffs and was disheartened when the villagers didn't welcome his preachings, then the Virgin Mary appeared before him in mortal flesh to announce that he should return to Galilea as his work had already concluded. From that journey by boat, all that remains are the sail (piedra Dos Cadris) and the ship (piedra de Abalar).